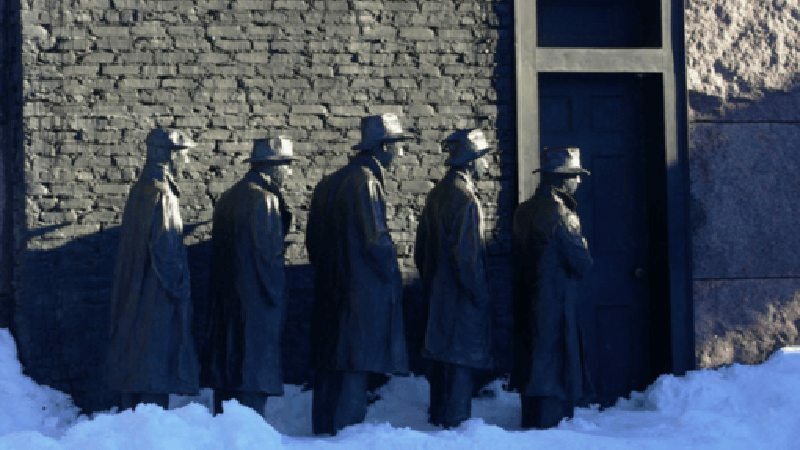 Real unemployment in the US today hovers around 8.3%, afflicting more than 17 million people. This is roughly equivalent to the combined populations of New York City, Los Angeles, Chicago and Houston. Over one third of the working age population has given up looking for work. On top of this, pundits project that many more jobs will be lost to automation in the near future, with computers and robots replacing as many as 49% of the jobs now done by humans. The mechanization of dirty, dangerous, repetitive, mind-numbing tasks should be a blessing. Instead, the future is described in apocalyptic terms. Why? The problem is rooted in the disingenuous narrative we are fed. Jobs, so the story goes, are mysterious, ephemeral things, whose comings and goings are largely beyond our control. The number of available jobs has to vary independently from the work that needs to be done and the number of people available to do it, or so we are told. There is plenty of work that needs to be done -converting our energy industry to renewables, repairing and enhancing infrastructure, building housing for all who need it, improving student-teacher ratios, increasing healthcare and eldercare staff, and so much more. And there are millions looking for useful work. The disconnect between people wanting to work, work that needs to be done and the number of jobs that happen to be available only occurs if the guiding principle for job availability is profit. But when the needs of society as a whole are prioritized over the needs of wealthy few at the top, then achieving permanent, full employment is a piece of cake. But since 1937, the productivity of American labor has increased more than six-fold! In other words, the value produced by a full day’s labor in 1937 would require less than two hours today. So an obvious solution to unemployment presents itself: reduce the workweek with no reduction in pay. If the workweek were reduced from 40 to 30 hours, it would create 53 million new jobs. This is more than three times the current number of unemployed. To fill all the remaining slots and maintain current production levels, we would have to plead with the governments of Mexico, Central America and elsewhere to send more immigrants our way! Can we afford this? Absolutely. Up to now – and especially since 1973 – increases in productivity have been siphoned off as corporate profits and enriched only those at the top. Implementing 30 hours work for 40 hours pay (“30-for-40”) would simply redirect newly produced wealth away from corporate profits and back into the pockets of those who produce it. Instead of all the benefits of automation and increased productivity going to the top 1%, 30-for-40 would allocate a greater share of those gains to working people. Big Business Despises Full Employment Not only would using 30-for-40 to eliminate unemployment directly cut into corporate profits, there are other side effects that corporate behemoths hate but working people would love. To begin with, full employment would strengthen the working class vis-à-vis the 1%. With abundant, well-paying jobs for all, there would be no one a recalcitrant company could hire as strikebreakers if the workers organized to withhold their labor. It would be more difficult to harass and victimize union organizers because, with full employment, all workers would be harder to replace. What’s more, less time at work leaves more time for other things. This would include time for rest, recreation, attention to family and exploring creative endeavors. But it would also allow extra time for education, organizing, getting involved and fighting back. In a world imbalanced by massive economic, social and political inequality, allowing the majority more time for education and organization is the last thing those at the top want to see. Jobs For All vs. Universal Basic Income: Of course, basic human solidarity demands that anyone who is old, sick, disabled or otherwise unable to work should be provided for at society’s expense, with their medical care fully covered and living expenses provided at union wage scales. This can easily be paid for by reallocating funds from the oppressive military budget and by taxing corporate profits. This policy should be combined with a guarantee of a job for all who are able to work. Lately, some have promoted the notion of a Universal Basic Income (UBI). To the extent that a UBI were funded by redistributing wealth from those at the top to those below – a principle that is by no means guaranteed by the concept – a UBI could be a positive reform. But a UBI is no substitute for a guarantee of jobs for all. Why not? First and foremost, labor is power. The only power that can counter the concentrated riches of the ruling oligarchs is the collective organization of millions of every-day working people, who, as it happens, produce all of society’s wealth. The root of working class power is the fact that the labor of millions of people generates the riches enjoyed by those at the top, as well as the considerably smaller share currently allocated to the majority. By withholding their labor en mass, working people have ultimate veto power over any government policy. Guaranteeing jobs for all strengthens the ties of working people to production, maximizing the number participating in the labor force and, thus, the number who have a hand on the lever of society’s productive apparatus. A UBI by itself, by contrast, does nothing to reinforce people’s connection to work – that is, to the fundamental engine of wealth creation. In addition, the rate of any UBI will necessarily be too low. There is a built-in imperative for a UBI to be small enough to encourage people to work. In order to induce people to work at all, the UBI has to be inadequate (or “barely adequate”) to live on by itself. But in the absence of guaranteed jobs for all, “encouraging people to work” means compelling them to compete for an insufficient number of low paying positions. When the supply of labor exceeds its demand in available jobs, wages are driven down, all other things being equal. And if the UBI is to be low enough to encourage people to work, it must ultimately follow wages downward. So, contrary to the assertion of UBI boosters that it would exert upward pressure on wages, a UBI without a job guarantee is just as likely to lead to a race to the bottom. A UBI is also susceptible to other kinds of manipulation. If a UBI is used to justify cuts to Medicaid, food stamps, unemployment compensation and other social programs, it’s all too easy for the programs replaced to be inadequately covered by the UBI, or for some sectors of the population to benefit at the expense of others. A UBI can be used to pit employed workers against those without jobs. And, a UBI would do little to address conditions on the job or provide more than a palliative remedy for the unjust distribution of gains from increased automation and productivity.